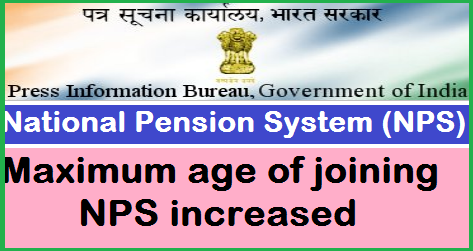 Maximum age of joining National Pension System (NPS) increased from the existing 60 years to 65 years under NPS- Private Sector. In continuance of the several initiatives under taken by Pension Fund Regulatory and Development Authority (PFRDA) during the last few years to increase the pension coverage in the country, PFRDA has now increased the maximum age of joining under NPS-Private Sector (i.e. All Citizen and Corporate Model) from the existing 60 years to 65 years of age. Now, any Indian Citizen, resident or non-resident, between the age of 60- 65 years, can also join NPS and continue up to the age of 70 years in NPS. With this increase of joining age, the subscribers who are willing to join NPS at the later stage of life will be able to avail the benefits of NPS. NPS provides a very robust platform to the subscriber to save for his/her old age income security. Due to the better healthcare facilities and increased fitness, along with the opportunities and avenues available in the private sector as well as in the capacity of self-employment, more and more people in their late 50s or 60s are now living an active life allowing them to be employed productively. The subscriber joining NPS beyond the age of 60 years will have the same choice of the Pension Fund as well as the investment choice as is available under the NPS for subscribers joining NPS before the age of 60 years. Subscriber joining NPS after the age of 60 years will have an option of normal exit from NPS after completion of 3 years in NPS. In this case, the subscriber will be required to utilize at least 40% of the corpus for purchase of annuity and the remaining amount can be withdrawn in lump-sum. In case of such subscriber willing to exit from NPS before completion of 3 years in the NPS, he/she will be allowed to do so, but in such case, the subscriber will have to utilize at-least 80% of the corpus for purchase of annuity and the remaining can be withdrawn in lumpsum. In case of unfortunate death of the subscriber during his stay in NPS, the entire corpus will be paid to the nominee of the subscriber. The increase in joining age will provide the options to the subscribers who are at the fag-end of the employment and expecting lump-sum amount at the time of retirement, but willing to defer their retirement planning for future, to open the NPS account and contribute the lump-sum corpus to NPS for better fund management by Professional Fund Manager to fetch better returns and plan for the regular income after some time. The Annuity rates available in the older age fetch better annuities than that at the age of 60 or less age. This initiative will allow a larger segment of the society particularly senior citizens to reap the benefits of NPS and plan for their regular income. Now, any Indian Citizen, resident or non-resident, between the age of 60- 65 years, can also join NPS and continue up to the age of 70 years in NPS.